I never said Thor is more powerful than Odin. The rest are just you whining. You have already written in this thread that Odin is a weakling and you think Thor beats Odin in a fight! You have no credibility. I am even more amused. Desperation to see concession where there is none accepted. Uh, no. I stated the exact opposite - that Thor can lift billions of tons so knocking down someone who weighs a few hundred pounds isn't particularly indicative of anything. Of course when I pointed out when Wonder Woman knocked Zeus on the ground with one blow and was standing over him, you said that meant nothing, completely displaying your hypocrisy on the matter. Now by YOUR own logic, DC Zeus is a weakling. Thor didn't just knock Odin down, he had Odin on his knees. Zeus wasn't on his knees like Odin was. I see. So according to you what direction you get knocked down in determines whether you're a weakling. If you fall forward, you're a weakling. If you fall backward, you're not. Wow, what other laughably ridiculous laws of fight depictions can motifian come up with? It definitely is not, but I don't try to act like I'm infallible and I admit my mistakes when I am wrong instead of doubling down on it like you leading to absurdities like you having one standard for Odin and another for DC Zeus. I'm using the same for both. Unless you can show me Zeus being on his knees from an attack from Diana that is. Yes! Doubling down on the knee defense! I love it. Zeus only lost his memories in the river. He was as powerful as ever. It's too late. You can't admit to being deliberately misleading on this example and then continue to do so as if you didn't already admit it. You have no credibility. Only kinetic energy. And he killed Zeus physically. Do you know what kinetic energy is? 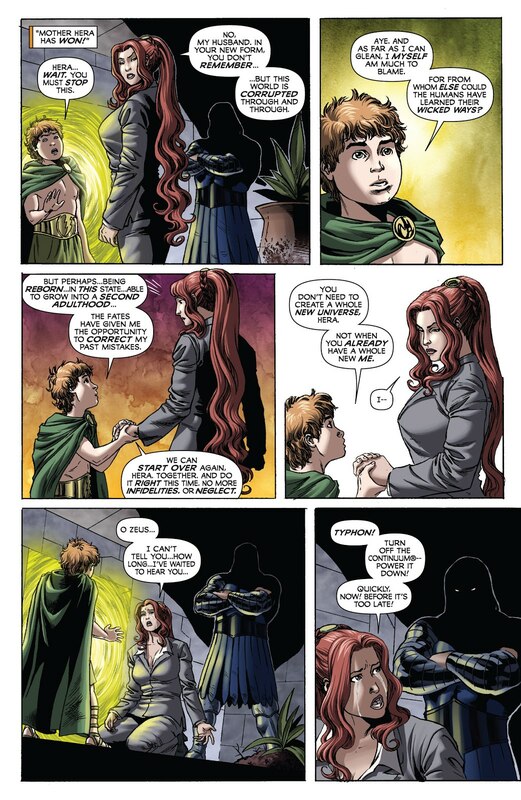 Again, this was a Zeus who was in the form of a human child, with the word "human" emphasized in the issue, who had lost his memory and had no experience with his power. Yes, I know what it is. Do you? Zeus had regained his memories. Hence why he was screaming that Typhon killed his wife. No, you're just flat wrong. Here are the scans explicitly showing that Zeus had not regained his memories. 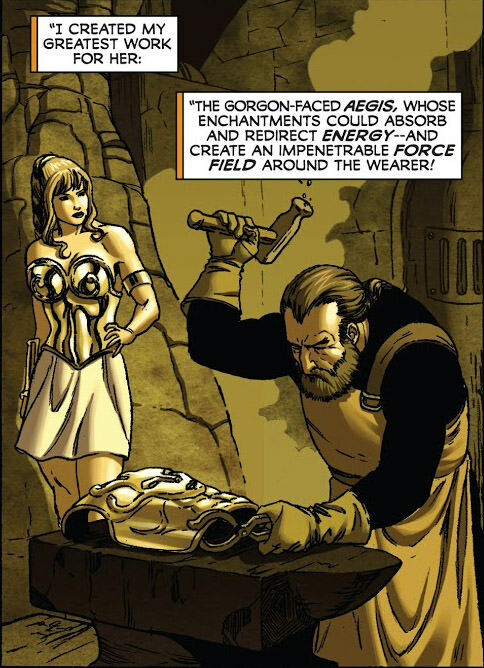 "In your new form, you don't remember," Hera tells Zeus. 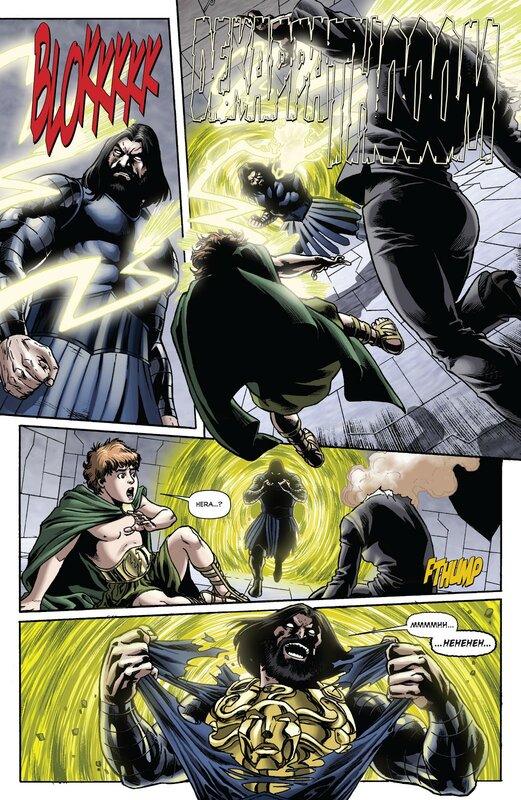 Then child Zeus and Hera both attack Typhon and again the comic explicitly shows the Aegis armor deflecting their attacks back on them, killing Hera. You're wrong and prove again and again, you have no credibility. Heh, how does it taste when you get a dose of your own medicine? It feels great that I can always point to direct evidence of you purposely using examples you know are misleading. You've always been doing that, but this time you admitted to it. What misleading? Everything I said happened exactly in comics. You were trying to show that Marvel Zeus wasn't that powerful by saying Typhon beat Zeus and Hercules beat Typhon while ignoring that this wasn't normal Zeus but amnesiac human child Zeus, that this wasn't normal Typhon because he was powered up by the Aegis, and that Hercules didn't beat Typhon with his own power but used the waters of Lethe. If that's not misleading, I don't know what is. And then you claimed that Zeus had regained his memories when he had not, which is plainly stated in the scans above. You have no credibility. If you didn't hate DC characters, you didn't have to explain yourself. Huh? That makes no sense. Obviously you think I hate DC characters, which I don't, so to demonstrate that to you, I pointed out clear examples in which I speak well of DC characters. Why would I speak well of characters I hated? You've obviously never heard of reverse psychology. Hmm, obviously I know what it is better than you. Please explain how my posting good things about DC characters for years and years on this board works as reverse psychology. Wow, you're so confused, you're responding to your own insults as if they were directed at yourself. You wrote both of the above lines. I am amused. Thor has given Odin more fights than Superman has given to Darkseid. Yet, you don't count them against Odin. 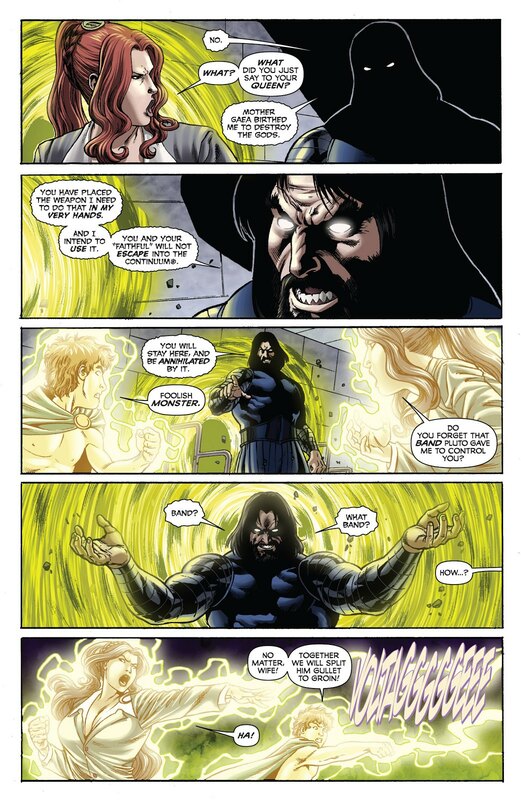 Odin usually dominates Thor in a way that Darkseid does not dominate Superman. I am not going to explain how I love Marvel and how Odin is my favorite character because he isn't. Nonsense. You just can't tell the difference between supporting who should win in a fight and supporting who you like as a character. Knight, for example, is someone who can clearly make that diffentiation. Knight is Bizarro you though. Trying to lowball the characters he/she likes as to not look biased. No. We both try to be as unbiased as we can in evaluating fights even when they involve our favorite characters. We may not always succeed, but we try. You, however, try to put over your favorite, evidence be damned. It's just distort, distort, distort. But answer this, which skyfather in DC can at least get 6/10 against Odin in a fight. It depends on how you define skyfather. Certainly DC's top powers like Mxyzptlk, Spectre, more recent Nekron can. They are not skyfathers though. Imps are not skyfather level. They are abstract levels in power. As I said, it depended on how you define skyfather. Spectre is all over the place and sometimes is skyfather level, sometimes even lower. Nekron is also all over the place and sometimes below skyfather level. And you yourself said Odin was more powerful than Spectre in another thread. I never said that. Wow, just outright lying now. Modern day Spectre, on average is more powerful than Odin, but Spectre has had showings in which he appeared less powerful than Odin's average. Which top tier can get 6/10 against Thor and Silver Surfer. Thunderbolt. So why don't you tell me which top tier Marvel characters beat Superman a majority of the time? Thunderbolt is definitely not a top tier. He is an imp and half of his self defeated and imprisoned Spectre and was warping entire universe. Thunderbolt has long been a member of the JSA. Interesting how Thunderbolt and the JSA didn't instantly beat every villain Spectre level and below in all those years. So tell me which top tier Marvel characters beat Superman a majority of the time?